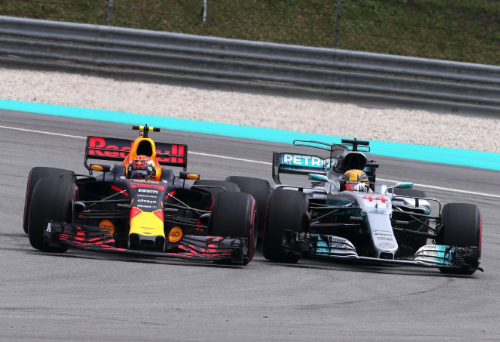 Red Bull driver Max Verstappen beat Lewis Hamilton fair and square to win the Malaysian Grand Prix. This was a win on merit, not by some luck and circumstances that gave him a victory present for his 20th birthday which he celebrated the day before. Here's what happened. Sebastian Vettel had his Ferrari out front during practice on Friday, but mechanical woes and two engine changes on Saturday put him to the back of the grid. He was therefore out of touch with championship rival Lewis Hamilton and had no chance to win. The Ferrari was fast, and Kimi Raikkonen just missed getting the pole by 0.045 of a second. "I'd rather have qualified in first place," he said after qualifying, "but I think tomorrow is a long race, it's going to be tough for tires and I think we should have a very good car tomorrow. I have a good feeling about it." Hamilton became the first driver in history to earn 70 Formula 1 pole positions. And that put him in prime real estate for a chance to win the 61st Formula 1 race of his career. Indeed, Hamilton took the lead at the start in his Mercedes. Raikkonen's good feeling didn't last long. His car had a turbo failure on the way to the grid and he never even started the race. Verstappen attacked Hamilton and passed him for the lead on lap 4. "Straight away I could see our pace was good and that Lewis was struggling with traction," Verstappen said. "I just went for it and used all the battery power I could to get past him." "Once I got past Lewis I could basically just focus on my pace and look after the tyres," Verstappen said, "and when I needed to speed up I had the pace to do it." Although he managed to jump from fifth on the grid to nearly grab second place on lap one, Valtteri Bottas was never a contender in the race, and therefore never able to challenge Verstappen. He faded back to fifth in his Mercedes. "Today was difficult," Bottas said. "I was trying everything I could. I was giving it all I had, but I was lacking pace and I was sliding around. The start was definitely the best part of the day. It was really good; I could actually attack a little bit and fight for positions. But not long after that I just started to drop down and couldn't keep up with the others." Daniel Ricciardo was fast in the other Red Bull, but running fourth in the early laps and having to spend time to get past Bottas put Ricciardo too far behind the front duo of Verstappen and Hamilton who were out of reach for the rest of the race. So Ricciardo finished third. Just about everybody started the race on Pirelli's super soft slicks, but Vettel tried an alternative strategy by fitting the soft compound tires. He went from last to fourth. "We have a very quick car," he said. "I think if we start ahead then we win the race. Obviously that didn't happen today. We had the quickest car for the majority of the race in clean air. We had to start last but certainly it was more entertaining, the first couple of laps in particular. Overall it was tough with Kimi retiring (Raikkonen) and for where we started, so a tough race." "The car was really good and our pace on the soft tire was better than I expected," Verstappen said. "It was a very physical race and very warm in the car, plus I haven't been feeling that well this weekend. But we managed to bring it home." To add (car) injury to what had already been a frustrating weekend for Ferrari, Vettel tangled with Williams driver Lance Stroll on the cool down lap. The Ferrari took a big hit. Vettel: "I went on the outside to pick up rubber; I think Lance wasn't looking and wanted to do the same but that was too late. I was there already and we had contact. That's completely unnecessary. I think he just didn't look and then decided to go and pick up rubber." Stroll: "The race wasn't going on so it wasn't intentional for either of us." Hamilton ended up gaining six more points over Vettel and now has a lead of 34 points with five races to go in the season. Verstappen has only finished eight of the 15 races so far this season. By contrast, Hamilton has finished every race, and Vettel and Bottas all but one each. "It is fantastic to see Max get a well-deserved victory after enduring so much bad luck throughout the season," Red Bull team boss Christian Horner said. "I said when Max's luck would change it would change in a dramatic way and it's difficult to believe the last time he was on the podium was at the beginning of April in China. Today he drove a truly dominant race, making a sensational pass on Lewis and then really controlling the race from there."